Packing winds of up to 185mph, Irma has been one of the most powerful Atlantic hurricanes on record. It caused widespread destruction as it churned across the Caribbean, affecting millions of people in its path and obliterating most of the housing on several small islands. While more than six million people were ordered to evacuate in the mainland United States, Irma has been catastrophic for the people of the Caribbean and is estimated to be the costliest storm ever to hit the region. Cuba was the latest to get a severe battering, before Irma turned north on Sunday and struck Florida. With Irma weakened to a tropical storm and Hurricane Jose no longer an immediate threat to land out in the Atlantic, it's time for us to close down our live blog. Thanks for checking it out and please come back to www.irinnews.org or follow us @irinnews for in-depth coverage of the response and recovery efforts as the Caribbean rebuilds after one of the most expensive and destructive hurricanes ever. State media has belatedly confirmed 10 Irma-related deaths in Cuba, including several who didn't heed evacuation warnings. Accused initially of responding too slowly to Hurricane Irma, the British government has announced a £32 million aid package and sent around 500 troops to Anguilla, Turks and Caicos, and the British Virgin Islands, as well as several aircraft and ships providing emergency shelter kits, relief specialists, rations, and clean water. The French government sent 200 personnel for security and rescue to Guadeloupe to coordinate efforts to badly hit Saint-Martin and St. Barts. It has also increased its military presence to 2,200 troops, amid widespread reports of looting. The Dutch authorities have deployed 265 military personnel and that number is expected to double in the next days, with 90 police officers coming in from nearby Curacao to help maintain order in Sint Maarten. The Caribbean Disaster Emergency Management Agency, known as CDEMA, was set up for these kinds of events and is coordinating a massive response effort that involves the main UN agencies and hundreds of smaller international and local NGOs. The UN’s emergency aid coordination body, OCHA, has deployed the United Nations Disaster Assessment and Coordination team to Barbados, while UNICEF had pre-positioned itself there to distribute drinking water, emergency kits, food, and medicine. Others mobilising include USAID/OFDA, ECHO, DFID, and Global Affairs Canada. Most efforts are currently focused on immediate needs – rations, drinking water, emergency shelters. As Hurricane Irma begins to lose its steam, having been downgraded to a category one storm with maxiumum sustained winds of 85mph, the extent of the damage in southern Florida will become clear with daybreak. At least four US mainland deaths were reported as Irma tore down power lines, knocking out the light to more than three million people, although most would have fled inland long ago. Communities along the west coast of Florida were badly flooded as Irma made landfall near Naples/Fort Myers and headed on up the coast, wreaking havoc also in the Tampa Pay, St. Petersburg area, but it was the Florida Keys that bore the brunt of the storm earlier and where the damage is likely to be most severe. Two giant cranes left dangling dangerously on the Miami skyline were a reminder of the reach of the giant storm. Disaster risk and insurance experts are struggling to grapple with the enormous economic cost of Irma, one putting it as high as $300 billion. Shortly after making landfall for the first time on the US mainland near Naples in southwest Florida, Hurricane Irma has been dowgraded to a category two storm (with sustained maximum winds of up to 110mph), according to the latest update from the US National Hurricane Center. With most of the media attention on Florida, it's easy to forget Cuba just suffered a severe battering from Irma when she had category 5 winds above 160mph. The images from Havana are dramatic, with people wading chest-deep through streets turned to rivers, others taking to boats. But the damage outside the capital, in the provinces of Camaguey, Matanzas, Villa Clara, and Sancti Spiritus, is reportedly even worse, with hundreds of houses destroyed and thousands displaced. Cuba is credited by some as being a leading country in hurricane preparedness. "What can we learn from this small island nation?" asks Branko Marcetic in this compelling article. And not only is Cuba looking after it's own; it has also dispatched hundreds of physicians to the worst-hit parts of the Caribbean. But this policy of medical internationalism is nothing new, as this IRIN commentary from shortly after the death of Fidel Castro in November last year illustrates. Irma has been downgraded to a category 3 storm with maximum sustained winds of 120mph (down from 130mph), according to the latest update from the US National Hurricane Center. Water is rushing out of coastal Naples and Tampa Bay areas ahead of an expected storm surge of 10 feet (three metres) or more. After much speculation about where Irma would make landfall in the mainland US (Miami? Tampa? ), latest forecasts suggest the Naples/Fort Myers area on southwest coast might take the biggest initial hit. Further north, in Tampa, there was time even to evacuate the flamingos. Even as it's Florida turn to bear the brunt of Hurricane Irma, it's important to remember that the streets of Havana in Cuba have been turned into canals, that Puerto Rico was hit very hard, that Haiti and the Dominican Republic suffered bad floods, and that the worst devastation was visited upon the Turks and Caicos, the US and British Virgin Islands, Anguilla, Barbuda, Saint-Martin/Sint Maarten, and Saint-Barthélemy. Proper aid will take weeks to find thousands of people in these places and it will be many months before some parts of these islands are habitable again. Irma has made landfall in the lower Florida Keys as a category 4 hurricane, with a gust above 100mph recorded: update from NHC. More than one million homes are reported to be without power and multiple tornado warnings have been issued. A second landfall was expected later Sunday in southwest Florida, with an earlier NHC advisory confirming that Irma was still a category 4 storm, packing sustained maximum winds of 130mph. BARBUDA: Damage estimates from satellite imagery confirm a heavy toll on Barbuda. UN analysts estimate 89% of structures are damaged in Codrington town. As 6.5 million Floridians are told to evacuate, forecasters predict that the eye of Hurricane Irma, strengthening to a category 4 storm again with sustained winds of up to 130mph, will make landfall on Sunday afternoon/evening somewhere in the Tampa Bay area. Coastal towns like St. Petersburg, and Tampa itself, have not been hit by a major hurricane for almost a century. The Florida Keys were already getting an early battering. The latest update from the US National Hurricane Center predicts that Jose will tonight move northwest away from the devastated eastern Caribbean territories of Saint-Martin, Sint Maarten, and Saint-Barthélemy. Tropical storm warnings are still in effect but hurricane warnings and watches have been lifted. Hurricane Jose, which is still a category 4 storm with sustained winds of up to 145mph, is forecast to turn away from the Caribbean and start weakening on Sunday. Local TV in the nearby nation of Antigua and Barbuda, which had evacuated an entire island rendered almost uninhabitable by Irma in case of a hit from Jose, said the population there had breathed a "collective sigh of relief". The received wisdom is that Haiti was spared a major hit from Hurricane Irma. This may be true, but try telling that to farmers in the north of the poorest country in the western hemisphere who have yet again seen their lives turned upside town. Jacqueline Charles has this important story for the Miami Herald. Irma claimed at least five lives in the British Virgin Islands, taking the overall toll to 27. The breakdown is as follows: Anguilla (British territory): one; Antigua and Barbuda (independent state): one; Barbados (independent state): one; British Virgin Islands (British territory): five; Puerto Rico (US territory): three; Saint-Martin and Saint-Barthélemy​ (French territories): 10; Sint Maarten (Dutch territory): two; US Virgin Islands (US territory): four. A little better news for Floridians as Cuba takes some of the sting out of Hurricane Irma, but the latest NHC update warns that further strengthening is still possible as the storm churns over the warm coastal waters on its approach to the US mainland. "The interaction with the terrain of Cuba has weakened the hurricane a little," the update says. "Maximum sustained winds have decreased to near 130 mph (215 km/h) with higher gusts, but Irma remains a category 4 hurricane on the Saffir-Simpson Hurricane Wind Scale. Irma is forecast to restrengthen once it moves away from Cuba, and Irma is expected to remain a powerful hurricane as it approaches Florida." There is more positive news too for the eastern Caribbean, where Hurricane Jose has weakened slightly and is forecast to take a more northerly trajectory. The hurricane warning for Antigua and Barbuda has been downgraded to a tropical storm warning. However, a hurricane warning remains in place for Saint-Martin, Sint Maarten, and Saint-Barthélemy, according to the NHC advisory. As Florida awaited its fate, Cuba took a heavy battering as Irma tore down trees and power lines. Futher east there was still little news from the Turks and Caicos, a British archipelago that took a direct hit from Irma on Friday. The damage is all too clear in the British and US Virgin Islands and the hardest hit of the Leeward Islands: Anguilla, Barbuda, Saint-Martin/Sint Maarten, and Saint-Barthélemy. Barbuda has been completely evacuated ahead of the arrival of Hurricane Jose, which is also due to hit Saint-Martin/Sint Maarten an island shared by France and the Netherlands. The island, along with neighbouring St. Barts, has already been decimated by Irma with more than half the homes said to be uninhabitable. “There is a sense of dread … utility poles are down everywhere. There is no power and no public water and it appears it may take a long time to restore,” Xaverius van der Hoek, who lives in Dutch-administered Sint Maarten, told CNN. Four deaths reported on Friday in the British Virgin Islands are yet to be corroborated, leaving the toll at 23, with two more dead confirmed in Saint-Martin and one more, a teenage surfer, in Barbados. The breakdown is as follows: Anguilla (British territory): one; Antigua and Barbuda (independent state): one; Barbados (independent state): one Puerto Rico (US territory): three; Saint-Martin (French territory): eleven; Sint Maarten (Dutch territory): two; US Virgin Islands (US territory): four. The Bahamas escaped the worst but the storm strengthened again with sustained winds of 165mph as it made landfall on northeastern Cuba. Irma was the first Category 5 storm to hit Cuba in almost a century, and as communications went down there were fears of flash floods and storm surges in populated areas. Irma weakened again to Category 4 shortly after making landfall in Cuba and was forecast to turn northwest and strike the Florida Keys on Sunday before heading northwards up the state of Florida. Six million people have been ordered to evacuate from Florida and Georgia. Back in the far eastern Caribbean, Hurricane Jose is poised to hit the already devastated Leeward Islands, packing winds of 150mph: NHC update. Almost the entire 1,000-strong population of Barbuda has been evacuated in advance of Jose, ferried off to the bettter resourced and higher-lying sister island of Antigua. 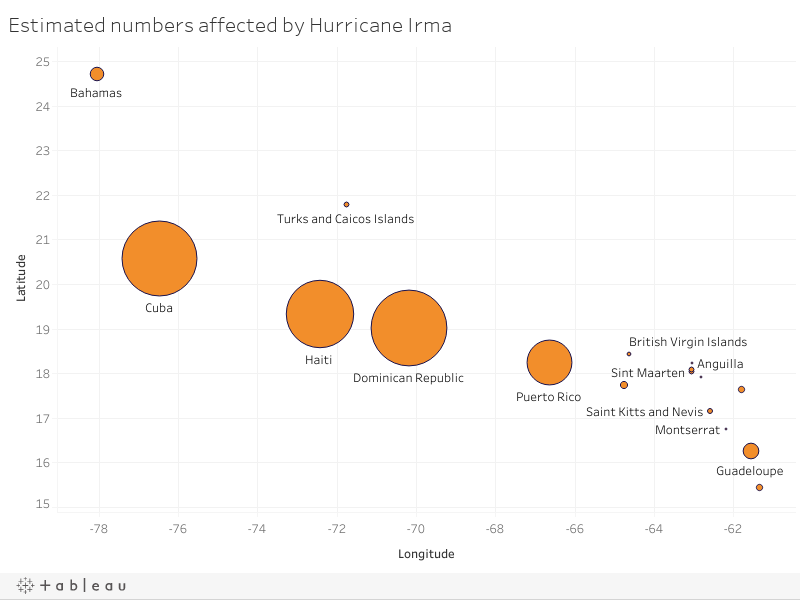 Experts from the Center for Disaster Management and Risk Reduction Technology’s Forensic Disaster Analysis Group estimate Hurricane Irma has already cost the region at least $10 billion, making it the Caribbean’s costliest storm of all time. For a detailed island by island breakdown of damage, needs, and humanitarian response, take a look at this situation report from the UN's emergency aid coordination body, OCHA. The Caribbean Disaster Emergency Management Agency has confirmed four deaths in the British Virgin Islands, while the Dutch PM announced one fatality on Sint-Maarten, taking the overall toll to at least 23. In its latest situation report, CDEMA also said hundreds of people had been evacuated from Barbuda ahead of the arrival of Hurricane Jose, but suggested ferries wouldn't be running much longer with sea conditions worsening. France's Interior Minister Gerard Collomb has said nine people are dead and a further seven are missing on the French territory of Saint-Martin. Another 112 people there have been injured and some 60 percent of homes rendered uninhabitable. France's response in the eastern Caribbean is being coordinated out of Guadeloupe, where 200 troops, doctors, and rescuers have been flown in to assist in the aid effort. For more, read the full report from the French international news agency AFP. The full extent of the damage on the Dutch side of the same island, Sint-Maarten, is still unclear but the prime minister of the Netherlands, Mark Rutte, has said the airport there is accessiible for military aircraft. Hurricane Irma has been downgraded to a Category 4 storm with maximum sustained winds of 155mph but is still described as "extrememy dangerous" and on course to do serious damage in the Bahamas and Florida, according to the latest update from the US government's National Hurricane Center. The head of the Bahamas emergency management agency, Captain Stephen Russell, told the BBC he was concerned that hundreds of people had refused evacuation orders on remote islands in the archipelago directly in Irma's path. These include Great Inagua (population 913); Mayaguana (277); Acklins (population 428); Crooked Islands (population 350); and Ragged Island (population 72). The toll from Irma has risen to at least 14 with four deaths confirmed in the US Virgin Islands, the count in the French dependency of Saint-Martin rising to five, three deaths in Puerto Rico, and one each in Anguilla and Barbuda. Dozens of injuries have also been reported, several of them serious. The news from the Dominican Republic and Haiti appears better. Irma only skirted past the northern coast of Hispaniola, the island they share, and, although there is widespread flooding and thousands of people have been displaced, the only initial reports of casualties were two injuries from a falling tree. There was no immediate word from Britain's remote Turks and Caicos archipelago, which took a direct hit from Irma's 175mph winds further to the north. The storm surge was expected to see waves of up to six meters (20 feet) swamp low-lying areas. The prime minister of the Netherlands has said the storm-damaged airport is ready for military use in the Dutch territory of Sint-Maarten, where he described the looting situation as "serious", according to the international news agency AFP. Following a similar path to Irma is Jose, now a major Category 3 storm, which has strenghtened further according to the latest NHC update with sustained winds of 125mph. Hurricane watches have been issued for Anguilla, Antigua, Barbuda, Saint-Martin, Sint-Maarten, and St. Barts. Known collectively as the Leeward Islands, this part of the eastern Caribbean was bearing the full force of Hurricane Irma only 48 hours ago and many of the residents are homeless after up to 95 percent of there buildings were destroyed or badly damaged. Vulnerable Haiti has escaped a direct hit from Irma, but heavy winds and rain were still reported across much of the country with some flooding in northern areas. Caution is still urged in what is the poorest country in the western hemisphere – one ravaged by deforestation and natural disasters that is prone to deadly floods and landslides. Haiti has endured terrible misfortune in recent years: Hurricane Matthew caused awful coastal flooding in October 2016 that left hundreds dead, while a catastrophic earthquake in 2010 killed hundreds of thousands, many of them beneath the rubble of the flattened capital, Port-au-Prince. To the north of Haiti, and at the other end of the development spectrum, the Turks and Caicos islands, a luxury tourist destination with a population of about 35,000, faced the full wrath of the hurricane. As Irma plowed right into the islands, officials in the extremely low-lying and remote British archipelago rushed to evacuate everyone to the highest ground available and into emergency shelters. With forecasts of sustained 175mph winds and a storm surge of five-six metres set to swamp all the low-lying areas, the omens are not good. Some better news from France as Prime Minister Edouard Philippe says no one died in St Barts after all and the toll on Saint-Martin was only four. Earlier, officials had put the total fatalities for the two islands at eight. Philippe did say another 50 people had been injured in the two Caribbean dependencies, two seriously. New estimates of affected populations from UNOSAT. The Puerto Rican governor’s office has confirmed three deaths in the US territory, according to the BBC, taking the overall toll from Irma to 13. More than one million people are without power and it could take up to six months to restore it in certain areas due to the island’s fragile power grid (see earlier updates below). The news isn’t good either from the British and US Virgin Islands, although there was no immediate word on casualties. Videos of Tortola in BVI show scenes of utter carnage with buildings levelled in every direction and piles of debris everywhere. For an update on the situation in USVI, where Saint Thomas and Saint John were reportedly hardest hit, watch Governor Kenneth Mapp below. The governor, meanwhile, is in hot water with the National Rifle Association after authorising the National Guard to confiscate privately owned guns and ammunition to prevent criminals taking advantage of the disaster. The International Federation of the Red Cross estimates 1.2 million people have been "battered" by Hurricane Irma so far. Many islands in the Caribbean are obviously popular tourist destinations, not least the Turks and Caicos, a British archipelago of 40 low-lying coral islands southeast of the Bahamas. According to the latest bulletin from the US National Hurricane Center, these remote islands are set for a direct hit from Irma this evening. Particularly worrisome are the facts that the storm is currently slowing, meaning its impacts will be felt for a longer period, and that the NHC is predicting a storm surge of 15-20 feet (five-six metres). Most of the Turks and Caicos islands have little high ground, putting the archipelago’s estimated 35,000 population at grave risk. Tourists are trapped too, some having tried desperately to get a flight out only to be told they have to stay. This CBC News report chronicles all the drama facing an Ottawa couple stranded in a luxury resort on the most populous island of Providenciales. "Right now, it's beautiful. We just surrendered to the circumstances," says Taras Klymyshyn, one half of the couple. "After the grieving and after the fact that they said it is what it is and we're facing Irma here in our rooms, we went to the beach because there's nothing really we can do." First light brings first news of Hurricane Irma’s impact in Puerto Rico. There was one reported fatality but it appears the island, the Caribbean’s fourth most populous country (after Haiti, the Dominican Republic, and Cuba), has been spared the worst, with well-organised evacuations from low-lying areas having paid off. That said, more than one million people are still affected and under blackout conditions as the storm has torn down power lines and trees and submerged coastal communities. A CNN correspondent tweeted that more than 56,000 Puerto Ricans are without water. For more on the expected months-long delay in getting power back to certain areas, check out this NPR report, which features AP’s reporter in San Juan, Dánica Coto. And for deeper analysis of the woes at the Electric Power Authority and underlying poverty and economic problems, this perspective from local investigative journalist Carla Minet for the Washington Post is worth a read. The Pacific Disaster Center has updated their impact advisory. The Turks and Caicos appear to be facing a direct hit. The northern side of Haiti and the Dominican Republic are also facing significant impacts over the next day or two. The extent of the loss of life and disastrous damage from Hurricane Irma in the eastern Caribbean is becoming clearer. The small French territories of Saint-Martin and Saint-Barthélemy, the tiny island of Barbuda, and the British overseas territory of Anguilla have been worst hit, according to preliminary reports. French Interior Minister Gerard Collomb has confirmed eight deaths, six on St-Martin and two on St. Barts. More than 20 injuries were confirmed there too, and French officials are warning the toll could rise as search and rescue operations continue. St-Martin official Daniel Gibb told Radio Caribbean International: "I have sick people to evacuate, I have a population to evacuate because I don't know where I can shelter them." He said "95 percent” of the island had been destroyed. There were similar scenes of utter devastation on Barbuda, where a two-year-old boy died and Prime Minister Gaston Browne declared a “national disaster” after Irma rendered an estimated 60 percent of the island’s 1,600 population homeless. A 10th death has been reported on Anguilla, where much of the island’s key infrastructure was destroyed and the British government is facing accusations of a lacklustre response. Back in Antigua after surveying the damage in cut-off Barbuda, Prime Minister Gaston Browne has confirmed one infant fatality from Hurricane Irma and said that a "search and rescue operation" is underway in case of more casualties. Fleshing out an earlier statement that 90 percent of buildings had been "decimated", Browne told local ABS Television/Radio that an estimated 60 percent of the 1,600-strong Barbudan populaton could now be regarded as "homeless". “What I saw was heart-wrenching, I mean absolutely devastating," Browne said. The prime minister also acknowledged a league of difference between the 185mph winds that demolished much of Barbuda and the 135mph battering Antigua endured, even though the islands aren't that far apart. “What is instructive is that a diference of 30-50 miles involving a hurricane can make a major difference," he said, putting the cost of reconstruction on Barbuda alone at $150 million. After the US government's National Hurricane Center confirms both Katia (in the Gulf of Mexico) and Jose (in the Atlantic) have strengthened to hurricanes, expert Philip Klotzbach says 2017 has earned the unenviable distinction of tied as the busiest Atlantic hurricane season on record. Check out the latest NHC update, which adds hurricane warnings for Bahamas and puts Turks and Caicos islands in Irma's direct path. At least two people have died and at least another two are seriously injured because of Hurricane Irma hitting the French Caribbean territories of Saint Barthélemy and Saint-Martin, France's overseas ministry has confirmed, according to the international news agency AFP. As Hurricane Irma looks increasingly likely to veer north later this week and pummel the east coast of south Florida, hundreds of thousands of residents are streaming out of low-lying areas to safer territory inland. A state of emergency has been declared for the entire state and mandatory evacuation has so far been declared in Monroe County, home to the Florida Keys, with evacuations underway of all tourists and residents there. A total of 5,000 personnel from Naval Air Station Key West and their families have also been evacuated. Schools in South and Central Florida are closed Thursday and Friday and many are being prepared as shelters to accommodate tens of thousands of people. There is a mad dash for food, water, gas and plywood supplies at local retailers, many which have run out. People are queuing for hours for gas and other provisions. There are also long lines outside banks as people try to draw money. Tolls have been suspended as people take to their cars to get away from coastal areas likely to be hardest hit. Others are battening down, putting plywood on their windows, filling sandbags to shore up water, dumping potential missiles like outdoor furniture into their pools, and making emergency plans for their pets. A total of 7,000 national guard members are gearing for duty Friday and large numbers of high water vehicles, helicopters, boats and generators are on standby. Search and rescue teams, just home after devastating Hurricane Harvey, are getting ready to be deployed again. A total of 30,000 national guard troops have been identified for possible deployment. The damage from a Category 5 storm hitting land would destroy many framed houses in low-lying areas like downtown Miami and power could be lost for weeks or months. Meanwhile, the Federal Emergency Management Agency (FEMA), gutted by Hurricane Harvey disaster relief, is down to its last $1 billion and is set to run out by Friday. Observers say Congress will have to act quickly to unlock additional funds. Already, Congress needs to agree to additional $8 billion for Hurricane Harvey clean up efforts and FEMA is currently restricting its spending to critical, life-saving activities in what is only the beginning of the hurricane season. If Irma hits the US as a Category 5 storm, it will only be the fourth to do so in recorded history. British and US Virgin Islands poised for major hit from Irma: latest NHC update. Irma has created carnage in several of the Leeward Islands, downing power lines, causing blackouts, silencing communications, destroying and tearing the roofs off buildings, and submerging many coastal areas, but no fatalities have yet been reported. The worst of the damage so far appears to have been in Barbuda, St. Barthélemy, and St. Martin, while Guadeloupe, Antigua, and St. Kitts and Nevis have avoided the worst, according to preliminary media reports. Forecasts suggest Irma’s powerful eyewall will pass in the coming hours just to the north of the Puerto Rican capital San Juan, where residents are hunkering down and a state of emergency was declared as early as Monday. As Irma leaves the Leeward Islands and takes aim at Puerto Rico, next in line will be the island of Hispaniola, which is divided between the Dominican Republic and Haiti. Although they could still escape the strongest of Irma’s winds, less powerful Hurricane Matthew in early October showed how storms of such magnitude can wreak havoc in countries prone to flood and landslide disasters. Winds of up to 145mph devastated parts of southern Haiti, leaving hundreds dead and up to 90 percent of homes destroyed. After that disaster, IRIN asked Haiti expert Jonathan Katz how it could have been better prepared. Here’s that interview again. Latest daily update from the EC's emergency department, ECHO. Early photos of damage in Antigua. A detailed list of locations likely affected by storm surge from GDACS. Disaster teams deploy: IRIN has learned that the UK's aid ministry DFID has sent staff to Barbados to prepare. We understand USAID/OFDA teams are deploying to Haiti and the Dominican Republic.